The Doctors shared that this year alone, 25 million Americans will have an episode of major depression. Greg and Jessica got married 18 years ago and when they were first married, everyone wanted to be around Greg. Jessica noticed a change in Greg four or five years into their marriage. Greg shared that all his life he noticed small signs of depression, but started to notice that it was getting worse. He was getting angry, frustrated, and would just explode. He was struggling with his career and his marriage, and he was isolating himself from his friends. He just wanted to be alone. Greg then handed his wife the car keys and asked her to admit him to a facility. He spoke to psychiatrist who put him on medications, but nothing seemed to work. The doctor then told them about a relatively new treatment called TMS, which stands for Trans-Cranial Magnetic Stimulation. The treatment was expensive and they couldn’t afford it, but it was their last option. After the third or fourth day of treatment, he noticed moments of clarity, but then after a little while he would be back in the dark. He never thought it would work, but those moments of wellness were worth fighting for. Greg and Jessica joined The Doctors in the audience. The Doctors applauded Greg for going to get help the day he did. Greg shared that as the months go by, things are getting brighter and he is now 100% depression-free. 18 months out, he’s still getting better and better. But even based on studies, the magnetic therapy has had a relatively small to moderate benefit, so it’s not a miracle for everyone. Dr. Todd Hutton explained that it’s not a cure for everyone but it is an option. He said it works well in people who failed other treatments or aren’t able to see results from other medications. The Drs TV: How Does TMS Work? 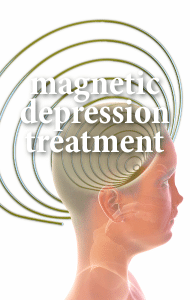 In Trans-Cranial Magnetic Stimulation, they have a high-powered magnet about as strong as an MRI machine send mood impulses to parts of the brain they know are active in depression. The magnetic pulses wake up the underactive areas of the brain. It can be done in the office and could even be done with pregnant women. Stacy Kaiser, a licensed psychotherapist, said to her, it’s an example of someone who was in an extreme situation. If something like this works, she think it’s terrific, but only in severe situations.